Looking to push the boundaries of what fiction can do? Experimental wunderkind Blake Butler is here to help. Not only has he published some of the most uncompromising fiction of the new millennium, he's done so through both independent and Big Four publishers. And as the editor of literary blog HTMLGIANT his keen eye has given many ambitious young writers a well-deserved platform. 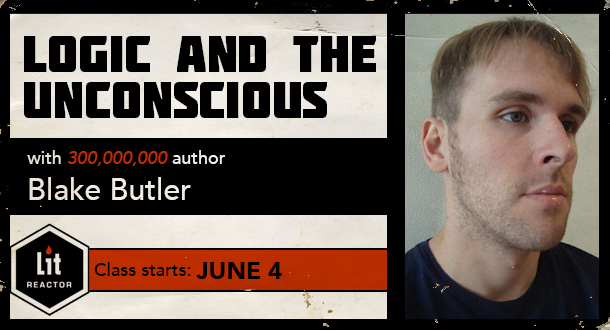 If you are tired of the same old same old, and want your writing to stand out from the pack, this course will help you explore methods and issues pertinent to using the unconscious mind to generate unique fiction. Over three weeks we will discuss ways to open up an intuitive approach to writing that involves the utilization of a more urgent, language and image-driven process to create new text, focusing on generating a complete object in a short time. We will then look at how to approach editing a raw document, including looking for ways to expand on what is there, and how to cut away the fat to find the true heart of what the work wants. Lastly, we will discuss how to apply this approach to writing a longer work, such as a novel. You will leave this class with new techniques to approach writing and editing in the spirit of expanding what fiction can do through you. Shed your inhibitions and make your mark. Lecture: In the first week, we will discuss principles of writing with momentum, aimed at producing a text in a short period with attention to energy, sound, image, and focus. We will discuss techniques and approaches to writing from the unconscious using images and words as triggers, and how to streamline your ideas on the fly using logic and other forms of channeling your voice. Assignment: Students will be asked to generate an original short or medium-length text, written in a specifically framed sitting or series of sittings, to be potentially revised and/or expanded upon in the following week(s). Lecture: In the second week, we will take the draft created in the first week and revise it, using the approach of writer-as-reader, looking for ways to improve on the initial text’s flow. We will discuss revision techniques and ways to find missed opportunities and places to expand, as well as recognizing what not to interrupt about the original tone of the work. Assignment: Students will revisit their text from Week 1 and seek to revise and/or expand upon it (though you will also have the option to start from scratch and then move into revision with a new draft). Lecture: In the third week, we will look toward applying the ideas addressed in the prior weeks’ exercises to a longer project. We will discuss topics pertaining to how to write the first draft of a novel in the spirit of the unconscious-framework outlined previously, including how to extend your vision across a full scale work, as well as ways to reinforce your vision and intent over time. Assignment: Students may choose to continue forward with the text generated in previous weeks, or start a plan to apply the ideas learned to a new text, with the intent in mind to create something larger from it, such as a novel, novella, or hybrid work. Apply what you've learned to expand upon your idea, with an eye towards turning it into a novel. "Blake challenges the way you think about writing. He applies unconventional techniques that help capture the mood when writing first drafts in multiple, short bursts; as well as gives guidance in how to really challenge yourself by setting logical boundaries that force the creativity to flow. This is one of those classes that changed the way I approach my own writing." "Blake’s class made me re-evaluate my approach to writing fiction and helped free my subconscious to be an active participant." "If you've ever suspected there's perspective you've been missing, insight into a process which is seldom discussed or beyond mainstream thinking in writing fiction, you will be grateful for Blake's class. His lectures and honest, generous feedback are sure to provoke your art in directions you may have never attempted otherwise."